Legends of Honor is an MMO strategy browser game developed and provided by Goodgame Studios. The freeto-play title set in a medieval land stands out due to its clear focus on fast, tactical, and diverse gameplay. 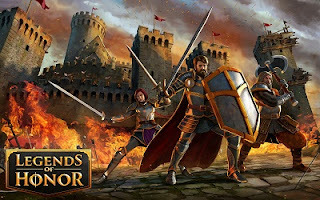 In addition to the classic strengths of the genre, Legends of Honor also features elements of role-play and real-time strategy. The player‘s task is to continuously build up their fortress and expand their rule. To do this, they produce resources and engage in exciting battles on the giant interactive world map, which they can explore freely with their heroes. These heroes can be developed and customized over the course of the game. Players fight in tactical battles to unlock new units and rise up in the rankings. Regular campaigns round off the gaming experience. As a free-to-play title, Legends of Honor can be played completely free of charge. Players can unlock extra functions by purchasing premium currency.